“This is an opportunity – for people who think they can’t sing, even people who’ve been told they can’t sing – to come and have a safe experience of exploring their voice,” he says. McMillan works with people in groups. It’s great for the few timid, off-tune voices that initially fear exposure. “No one is going to be put on the spot to sing alone,” he emphasizes. On the first Wednesday of every month, McMillan and maybe 70 others drop into St. Luke’s Anglican Church at 760 Somerset St. West at 7:30 p.m. It’s a 2 ½-hour voice discovery session with one 20-minute break for herbal tea. No formal fee, only anonymous donations. “Last time, I had 12 members of the Ottawa Welsh Choir who came and absolutely enjoyed it, even though we’re doing much simpler music than they’re accustomed to doing,” says McMillan in his seventh year of conducting these unscripted drop-ins. “People come back month after month. They’re high school dropouts and PhDs and everything in between, well-to-do people and poor people.” Even accomplished singers like Ottawa blues artist Sue Foley have attended. Everyone sits in concentric circles in the church chancel. The drop-in agenda is informal. At the start, McMillan might ask group members to deepen and lengthen their breath. “I might give them a single sound, an ohhhh sound and (say) ‘hold that’. Or I might give them a pair of phrases and I emphasize the partnership of the voice with the space that it’s in, and it’s a glorious acoustic space. So they get a feeling of the soaring of the voice without having to push it. There’s a wonderful feeling of soaring and then the silence. “This is the exciting thing for me. Some of these are people who have never sung. “If we are singing a simple song and singing it over and over and over again, as we sometimes do, there will often be an opportunity – I will ask with my eyes ‘Would you like to sing the verse yourself?’” Someone might step forward and everyone else hums. 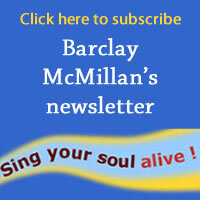 How did McMillan come to encourage others to sing? Now McMillan allows others to find the hidden powers of the voice. Julia Elliott writes for Style Weekly. Copyright 2004 The Ottawa Citizen. Reprinted with permission. So there is a session tomorrow …….? !